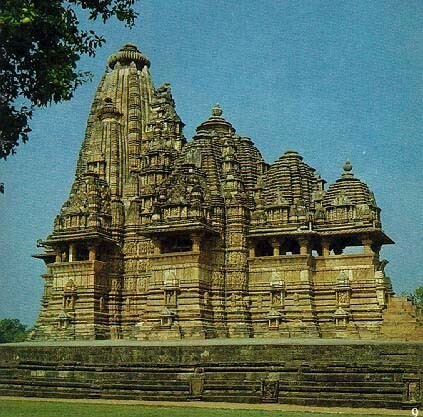 The complex of temple at Khajuraho was built during the Chandella dynasty between 950 and 1050. There are 24 great temples, each decorated with elaborate carving. They are divided into three distinct groups and belong to two different religions - Hinduism and Jainism. The Western Group, which is the largest, built by the Chandela rulers. The Eastern Group comprises of five detached sub-groups in and around the present village of Khajuraho . The Southern Group is the most distant one comprising of two main monuments near and across the Khudarnala. Some of the world famous temples of Khajuraho are : Lakshmana , Kandariya Mahadev ,Chaunsath Yogini , Vishwanatha , Devi Jagdambi , Duladeo , Chitragupta , Brahma . The largest and grandest temple of Khajuraho is the immortal Kandariya Mahadeva ( Madhya Pradesh), which is attributed to king Ganda ( 1017-1029 AC). It is perfectly symmetrical, and soars 31 m high. Though the four temples that stand at the corners of the main shrine are now in ruins, the main shrine has an exquisitely carved entrance arch with a multitude of themes. In this temple there are about 900 statues with most of them nearly 1m high .